Durham captain Dale Benkenstein says his team can be proud of their form this season regardless of where they finish in the County Championship. 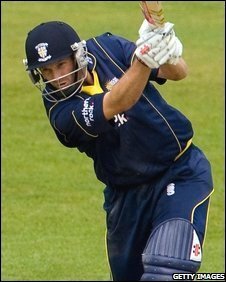 The 34-year-old leads Durham into their final match against Kent with a chance of clinching the title and is hopeful of ending the campaign on a high note. "It is fantastic for us to be in this situation for two years running," he told BBC Radio Newcastle. "We can be happy in the way we've played and we do still have a chance." Weather has been a thorn in Durham's side for much of the campaign, rendering 11 out of 13 playing days in September unplayable. And the South African is adamant the club's position could have been made much simpler had play been possible on those occasions. "Last year was a terrific year for the club and it was also going to be difficult to match that. "We [have] probably left it a little bit late now and some of that may not be our own fault. "If we'd picked up a few more points, batting and bowling points by having just got on the field then we'd probably be in a better position. "If you put it all in perspective it's been a top season so far." Durham are pushing to win their first ever County Championship title, along with 2006 winners Nottinghamshire who lead the table, Somerset and outside chance Hampshire.